Raiatea is the second largest of the Society Islands in French Polynesia. The chief town on Raiatea is Uturoa, administrative center for the Leeward Islands (French Îles Sous-le-vent). The islands of Raiatea and nearbyTahaa, are both enclosed by the same coral reef, and may once have been a single island. Shuttle boats take you from Raiatea to Tahaa where you can choose to take a panoramic hike through mountains and visit a vanilla plantation. Raiatea's most famous landmark, is an open air temple made up of seven marae built of stone, once a religious homeland for the Polynesian Maori. Other attractions include water sports, adventure activities, cultural tours, lagoon excursions and tours of pearl or vanilla farms. Port Location – The port is located at the main town of Uturoa in Uturoa harbor. Transport Links –Air Tahiti offers services from the Tahiti with stops at Bora Bora, Moorea and some of the other islands depending upon cargo and people. 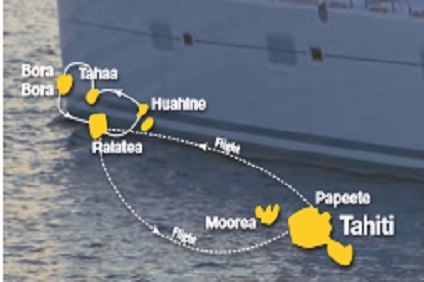 7 Night Cruise sailing from Raiatea roundtrip aboard a Lagoon 620 Catamaran.